Over an hour-long Sunday evening meeting of Gujarat High Court Advocates Association President Yatin Oza and other office bearers with the Chief Justice of India Ranjan Gogoi has brought an end to the indefinite strike called by the Association to protest the SC Collegium’s recommendation to transfer Justice Akil Abduhamid Kureshi. Advocate Oza told LiveLaw that he had requested for an appointment with the CJI who was “kind enough to accord a meeting”. Oza, Association’s General Secretary Prithviraj Jadeja and Joint Secretary Hardik Brahmbhatt met the CJI on Sunday evening at 6:15 PM. Refusing to divulge what transpired in the meeting, Oza said, “I cannot divulge the details but 70 minutes is not a small time. The CJI could have given us just a minute or said that he is not interested in hearing us as the c collegium has considered all material before it. But he was kind enough to give us time”. “The fact that I withdrew the strike immediately (after the meeting) and asked the committee not to file the writ petition, is enough for one to draw the conclusion,” said he maintaining he cannot speak about the details. Oza, however, reiterated that the whole Bar, in one voice, opposes Justice Kureshi’s transfer while stressing that false and fabricated material about Justice Kureshi was placed before the collegium only because he had ruled against the then CM Narendra Modi’s decision to uphold the Governor’s decision to appoint former high court judge RA Mehta as the state Lokayukta and had also sent BJP chief Amit Shah to CBI custody in the Sohrabuddin Sheikh fake encounter case. Following the meeting, a message was sent out to the members of the Bar to resume work thereby calling off the strike being observed since November 2 to protest the decision of the collegium to transfer Justice Kureshi, senior most puisne judge of Gujarat High court as the fifth senior-most judge of the Bombay High Court. Advocate Oza had sought an appointment with the CJI post the November 1 meeting in which the Association had unanimously resolved to go on the indefinite strike from November 2. The message sent out post the meeting with CJI read, “…I, as President of our Bar had sought an appointment of the Chief Justice of India to apprise him of the unanimous view of our Bar and its aforesaid resolution. I was given an appointment on Sunday the 11 November 2018 at 6:15 PM at his residence. “I along with Mr Prithviraj Jadeja and Mr Hardik Bhrambhatt called upon the Chief Justice of India at the appointed time. We apprised him about the high regard and respect our bar unanimously has for Justice Kureshi in view of his unimpeachable integrity and conduct with the members of the bar. We handed over a copy of the resolution of the bar. The honourable chief justice was very receptive to our views. His approach was so cooperative and constructive that I believe as head of our judiciary we should leave it to him to assuage our grievance and not to precipitate the matter by continuing the strike. In view of above, I and many other senior members of the Bar feel that matter should not be so unnecessarily stretched that it becomes counter-productive and harms the very cause for which the Bar has stood up united. Under the circumstances, I as President request one and all to resume work”. It is to be noted that on October 31, the SC Collegium comprising CJI Ranjan Gogoi, Justice Madan B Lokur, Justice Kurian Joseph, Justice A K Sikri and Justice S A Bobde recommended the transfer of Justice Kureshi to Bombay High Court “in the interest of better administration of Justice”. On November 1, the Centre notified the transfer of Justice Kureshi to the Bombay High Court and was appointed the Acting Chief Justice of the Gujarat High Court the next day. 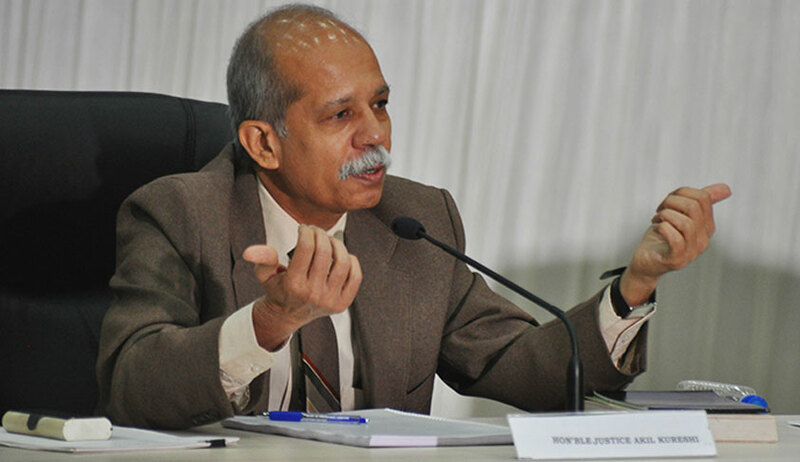 The Advocates Association had in its November 1 resolution termed Justice Kureshi’s transfer recommendation “unwarranted, uncalled for and unjust” saying the Bar “fails to discern any good reason for the same and believes that such transfer is unjustified and certainly has no connection with better administration of justice”. It had also resolved to challenge his transfer by way of a writ petition.